How can one man achieve so much while facing numerous challenges that threaten to undermine his successes at every venture? How can he remain courageous in the face of adversity, and come out a giant of a man every time? How can he rise up from relatively humble circumstances to contribute to the development of science and technology in Jamaica and the world? Henry Isaac Clore Lowe answers these questions and more in, It Can Be Done! It Can Be Done is a story of resilience, personal conviction and a desire to make the world a better place. 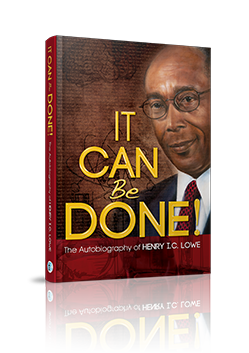 Follow the journey of this brilliant scientist, outstanding educator, eminent public servant, accomplished and astute businessman and noble Jamaican in this unplugged autobiography, where all is told. Share in the joys, the accomplishments and the challenges of a man, who through it all has remained steadfast in his dictum: 'It Can be Done'.